Before we talk about what happened with Austin, let’s take a look at what exactly this “black and white string” was and why it’s used in dentistry. Dental Retraction Cord – © Ultradent Products, Inc.
Usually when dentists cut teeth for crowns, they will pack a piece of string, known as dental retraction cord, gingival retraction cord, or just dental cord between your tooth and your gums. I’ve also used retraction cord when doing fillings on teeth that have a cavity that goes below the gum-line. This cord helps move the gums away from the teeth and can also be treated with a solution that prevents the gums from bleeding. That way, the dentist can focus on preparing the tooth without the gums getting in the way. The dental cord also helps the dentist make sure that the whole tooth gets recorded when an impression is taken. If you want to see what impression cord looks like in the mouth, scroll down to Figure 3 on this page for a picture (the dentist has prepared a tooth for a type of filling that will be made in a dental lab.) This article has another picture of dental retraction cord. Is Dental Cord Harmful to Your Gums? In Austin’s case, it would appear that the dentist and dental assistant simply forgot to remove the retraction cord after the impression was taken and just cemented the temporary crowns on the teeth with the retraction cord in place. If the retraction cord was in between the gums and the tooth for an extended period of time, the gum tissues may have started growing around it and it probably caused more pain and bled more when Austin removed the cord during his oral hygiene routine. Although having the cord around his gums probably wasn’t very comfortable, the studies seem to show that there aren’t any long-term harmful effects. Thanks for your question, Austin. Hopefully you’ve helped more people know what to do if they end up finding some cord between their teeth and gums after getting their temporary crowns put on! If you have any questions about dental retraction cord, I’d love to hear them in the comments section below. Thanks for reading! Having a crown come off of your tooth can be very frustrating. Sometimes you just can’t get into the dentist right away because you’re too busy, you’re on vacation, or your dentist can’t fit you in very quickly. Some dentists might recommend that you use a temporary crown cement until you can be seen at the dental office. If your dentist doesn’t suggest a brand name, how do you know which temporary crown cement to use? There are many different types on the market. 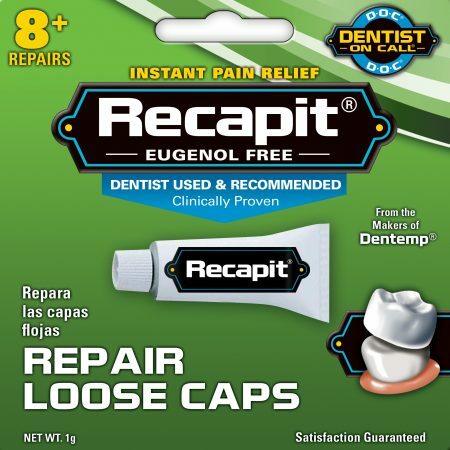 I I decided to provide you with some guidance by reading over the reviews on three of the most popular products for re-cementing your crowns that have fallen off: Recapit, Temparin, and Dentemp. Below the reviews, you’ll find a few quick tips on how to make your temporary crown cement work. 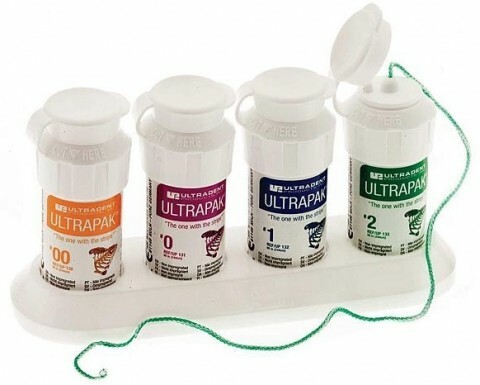 Recapit is available in a multi-use vial or in a stay-fresh tube. It is a one-step cement, meaning that you don’t have to mix anything together. All you have to do is scoop it out and use it to glue your crown back on. Unlike the other two main temporary cements, Recapit is made only to be used to recement crowns. 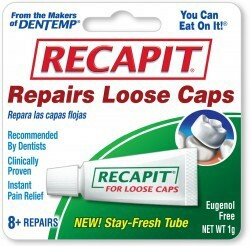 Recapit should not be used to replace a lost filling. The reviews on Amazon range from good to bad. Many people report that it doesn’t hold their crown on. One person said that their crown fell off when they sneezed. Temparin temporary crown cement is available in a multi-use vial as well. 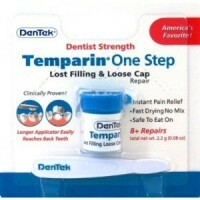 Just like Recapit, Temparin is a one-step cement which means that you won’t need to mix anything. On Temparin’s Amazon review page, it only earned 1 5-star review and that was from somebody that used it to replace a filling, not to re-cement a crown. Dentek has come out with an updated formula that they claim is now 10x stronger. It is pictured in the composite photo at the top of this article and is called Temparin MAX Hold. Interestingly, the Dentemp One Step seems to have some of the worst reviews while the Dentemp One Step Maxium Strength and Dentemp Original have some of the best reviews. I noticed that many people complained on the Dentemp One Step reviews that they had changed their formula and what was once a 5-star product is now a 1-star product. 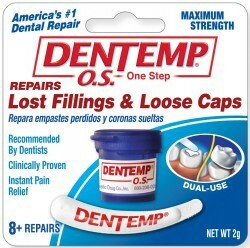 Dentemp Original seems to be the answer to that reviewer, but the one person who reviewed it appears to have been using it to replace a filling, not re-cement a crown. People also note that Dentemp O.S. Maximum Strength seems to harden very fast, so you may want to try a practice run first to see how fast you need to work to get your crown glued back on. What’s the Best Way to Re-Cement a Crown When It Falls Off? The number one piece of advice that I can give you is to follow the directions exactly as written. Clean out the crown. The crown probably has some old glue/cement stuck inside of it. It is important that the inside be clean and dry so that the new cement can attach to the crown and hold it to your tooth. Make sure the tooth is clean and dry. If you can, blow it dry. Even a little bit of water can cause the cement to not work well. Before cementing it back on your tooth, you might want to make sure that the crown fits evenly on your tooth. If it doesn’t, there may be some old cement on the tooth or inside of the crown. Some people report that if you cement it just before going to bed, it will form a stronger bond as you won’t be using it while you sleep. This may not work too well if you know that you grind your teeth at night! Based on the reviews (note that they are unscientific), it appears that Dentemp O.S. Maximum Strength is the best cement for recementing your crown, followed by Recapit and Temparin. Remember that before attempting to re-cement your crown you should talk to your dentist to make sure that it is appropriate. Make sure that you read all package inserts to understand how to use the product, what specific risks are present with use of the product and how to minimize those risks. If your crown is on a back tooth or upper tooth, know that there is a higher risk of you swallowing or aspirating (breathing in) your crown. If you have any doubts about whether or not you can get your crown re-cemented, you should talk to your dentist to see what other options are available. 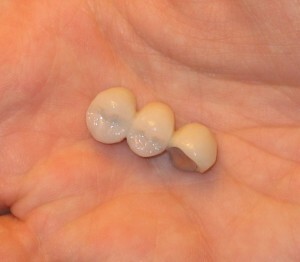 A reader recently asked me if it was possible to get a cavity on a tooth once it has been crowned. Although it seems logical that a crown covering the tooth would prevent this, that is not the case. A tooth with a crown can get a cavity! Can You Get a Cavity on a Tooth With a Crown? 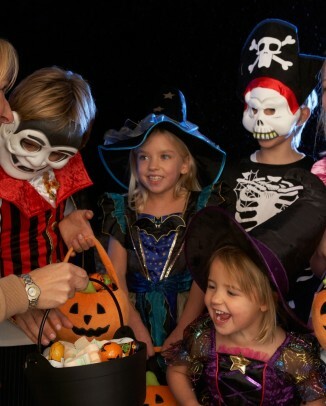 When a dentist makes a crown for you, he or she will remove all of the tooth decay or cavity that was present. 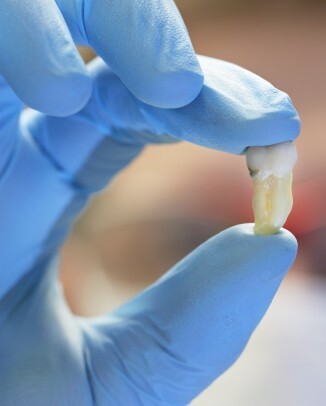 The dentist then cuts around the whole tooth so that a crown can fit over the remaining tooth structure and still appear to be a normal-sized tooth. The crown/tooth interface is usually right around the gum-line. That means that you still have tooth structure in your mouth that is below the crown. If you aren’t brushing and flossing to remove the plaque that lives under the gum-line, you can get another cavity on the same tooth. What Happens When You Get a Cavity on a Tooth With a Crown? 1 – If the cavity goes too close to the pulp, you may have to have a root canal done if you haven’t had one yet. 2 – You may need a procedure done known as crown lengthening. Crown lengthening means taking away some of the bone that supports your tooth so that there is room for the dentist to remove all of the cavity and still prepare the tooth for a crown. 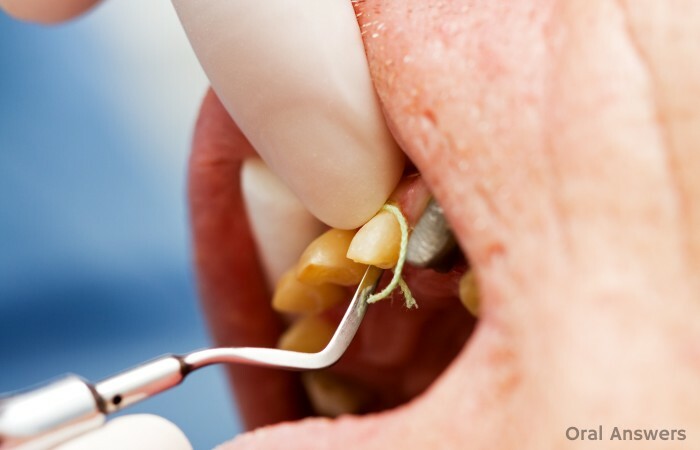 3 – You may have to have the tooth pulled if the decay has spread too far into the tooth. 4 – If you keep the tooth, you will most likely need a new crown made. The procedures listed abovet are all quite costly (aside from pulling the tooth.) Hopefully that will motivate you to keep your crowned teeth clean and in pristine condition! Do you have any questions, comments, or experiences to share about crowned teeth and tooth decay? Leave them in the comments section below. Thanks for reading! A couple of days ago, a middle-aged woman who we’ll call Beth, brought a crown into the dental school in a plastic bag. Her crown had fallen off of one of her molar teeth about six months ago. Unfortunately, she didn’t think it was very urgent to get it back into her mouth. Beth waited until she had another reason to come to the dentist and brought her crown along with her. She was hoping we could glue it back on. We couldn’t. Beth’s tooth was so badly decayed that it had to be extracted. When we told her the news, she was quite surprised, as it had only been six months since it fell off. If your crown does fall off, remember that you need to get to your dentist as soon as possible. Don’t put it back on and then neglect going to visit your dentist. You could infect the tooth and in the worst case scenario you may need to have the tooth extracted a few years down the line. This patient is a great example of why it is so important to see the dentist after your crown falls off. Crowns that are sitting on healthy tooth structure don’t generally just fall off. The reason most crowns come off is because there was a leak that slowly allowed saliva and bacteria to enter in between the crown and the tooth. Over time, the bacteria can cause decay to occur under the crown. This decay weakens the bond between the crown and the tooth and eventually causes the crown to fall off. If you just leave the crown off and procrastinate a visit to the dentist for a check-up, you could be allowing the problem to get much worse. Enamel (the outermost layer of the tooth) is pretty resistant to tooth decay. Dentin, the softer layer under the enamel (click here to read about the different layers of our teeth), is not nearly as resistant to tooth decay. The crown replaces the enamel and some dentin on the tooth. When the crown falls off, it leaves behind a tooth that was shaved down to hold a crown on it. When the tooth got shaved down, most of the enamel was drilled off, leaving cavity-susceptible dentin. If the crown fell off due to tooth decay and you leave it off, then every time you eat you are feeding the bacteria growing on that tooth and further breaking it down. 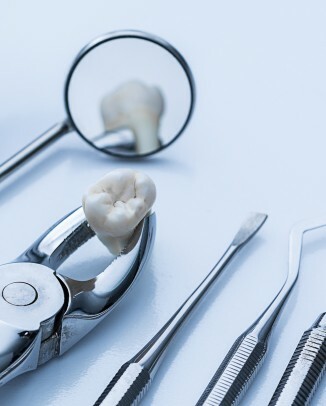 In fact, those bacteria will continue to multiply, and before you know it, they will end up eating away what was left of that tooth, making an extraction necessary. For a closer look at how these bacteria eat away your teeth, read What Every Human Needs to Know About Plaque. Beth didn’t know that it was important to come to the dentist when her crown fell off. But now, you do. If you want to keep your teeth healthy, it is important to make an appointment with your dentist if your crown falls off – right away. Do you have any questions about crowns or bridges? Please leave them below in the comments section and I’ll get back to you. Thanks for reading! 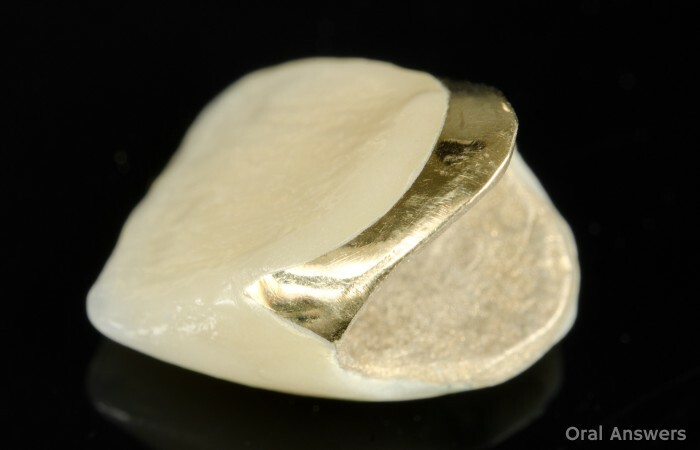 How Can Gold Fillings and Crowns Work When Gold Is So Soft? Recently, a reader asked how gold could be used in the mouth when it is so soft. It would seem like the high forces that occur doing chewing would alter the gold filling or crown. Since composite fillings and amalgam fillings are so much harder, wouldn’t they last longer? Technically, the reader is correct. If gold were used in its pure form, it wouldn’t be strong enough to serve as a good dental restorative material for inlays and crowns. When the term “Gold” is used in dentistry, it is usually describing an alloy that contains gold. An alloy is a mixture of two or more metals that have atomically bonded together. 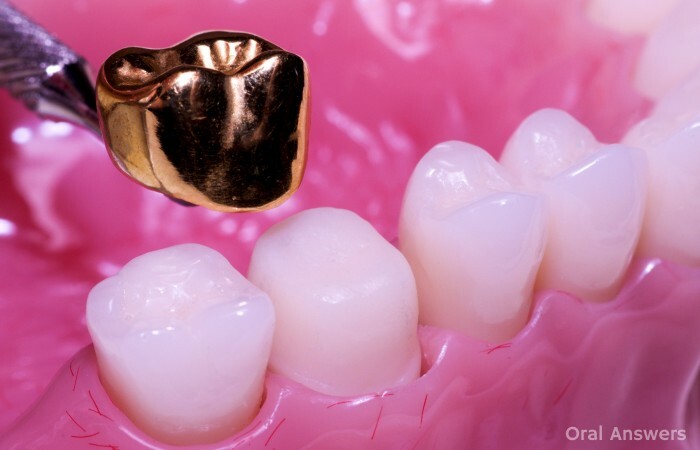 When gold is put into the mouth as crowns or indirect fillings, it is found as an alloy. The gold found in your mouth is usually combined with silver, copper, platinum, palladium, and/or zinc. 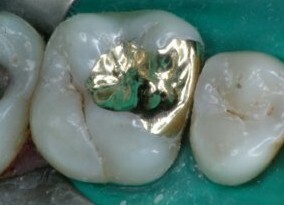 There is a very uncommon exception: direct gold fillings. Direct gold fillings are pure gold. The dentist simply condenses very fine sheets of gold into your tooth and they weld together at room temperature. These fillings aren’t very strong, but they are an excellent choice for areas on your teeth that don’t need to withstand lots of force. Direct gold fillings are rarely done today due to its high cost, sensitive technique, and the availability of newer, more esthetic composite filling materials. 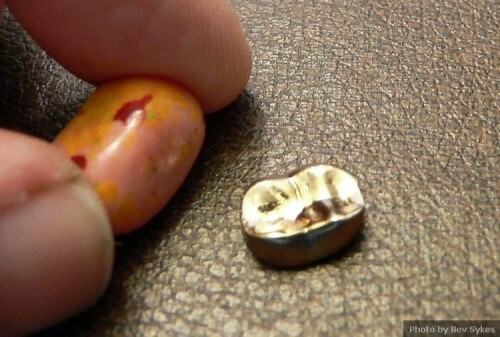 More than likely, if you’ve had a gold filling, it was made at a lab and is a gold alloy. Since the gold in your mouth is not pure gold, it might not be worth as much as you think. You may want to think twice before selling your gold fillings to make some money in this down economy! 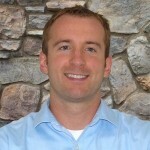 Do you have any questions about gold fillings or crowns? Leave them in the comments below! A few years ago, I was hanging out with one of my friends. He was biting into a sandwich and his crown came out of his mouth stuck in a piece of bread. Being a big fan of dentists, I went to the dentist with him that same day and watched as the dentist cemented the crown back into his mouth. Unfortunately, not everyone can make it to the dentist right after their crown falls off. Hopefully, if you do end up getting a crown in your life, it won’t fall off. However, if it does, here’s what you should do. First of all, get the crown out of your mouth. You don’t want to risk swallowing it or accidentally breathing it in. If you swallow it, it will probably pass without a problem, but after it’s been through your digestive system you probably don’t want it back in your mouth! If you end up accidentally breathing it in, it could become infected. Next, examine the crown and look in your mouth. 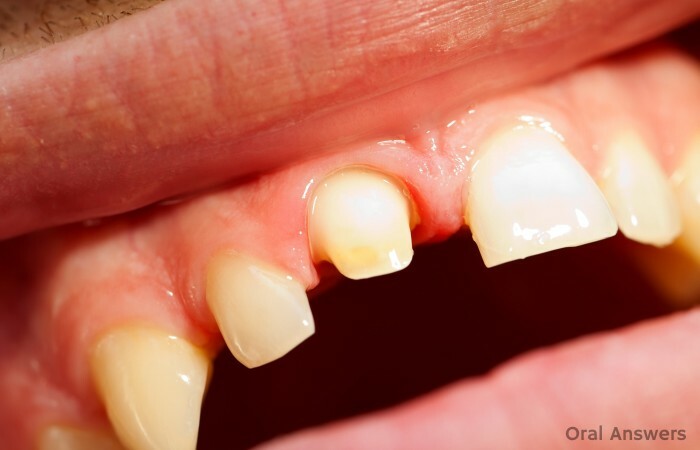 If your tooth fractured and is inside the crown, you will have to see your dentist before anything can be done. If the crown looks hollow or if it is not hollow but there is a small metal rod coming out of it (about the width of a paper clip), then you should be able to temporarily cement it back into your mouth before seeing a dentist to get it permanently cemented. Before proceeding, check with your dentist to see if it will be alright if you use temporary cement from the drugstore to temporarily put your crown back on. Take a toothbrush and gently clean off the crown and the tooth inside your mouth where the crown was located. After cleaning, make sure that the crown and the tooth are as dry as you can get them. Next, you will need to have some temporary crown cement which you can purchase at most any pharmacy. A popular brand name of this cement is Recapit Temporary Crown Cement, which is a temporary glue that will hold your crown onto its underlying tooth structure until you can get in to see a dentist. Remember to be careful and not chew too hard on the crown that you have re-cemented. Don’t chew sticky foods like caramel or taffy. The temporary cement is much weaker than the permanent cement that the dentist initially used. 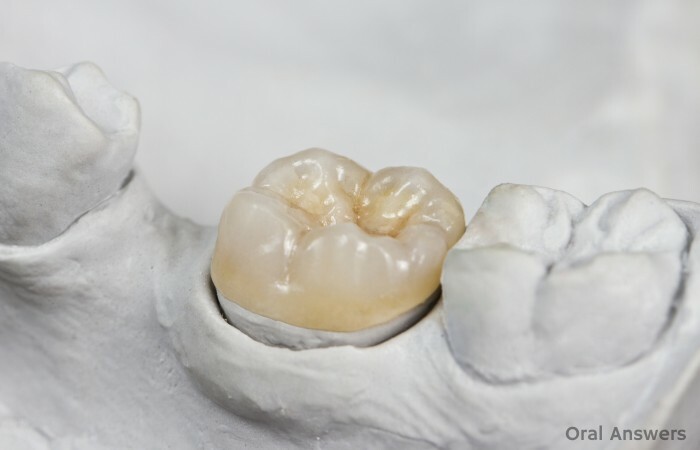 Update: I have written an article that talks about the different temporary crown cements, which ones have the best reviews, and also gives some tips on the best way to re-cement your crown. You can read it at Which Temporary Crown Cement is the Best? You need to make sure that you go to your dentist so he or she can permanently cement your crown back to its underlying tooth structure. The crown is still slightly loose, temporary cement really is temporary. Also, after the crown came off, the underlying tooth structure was exposed to the bacteria in your mouth. 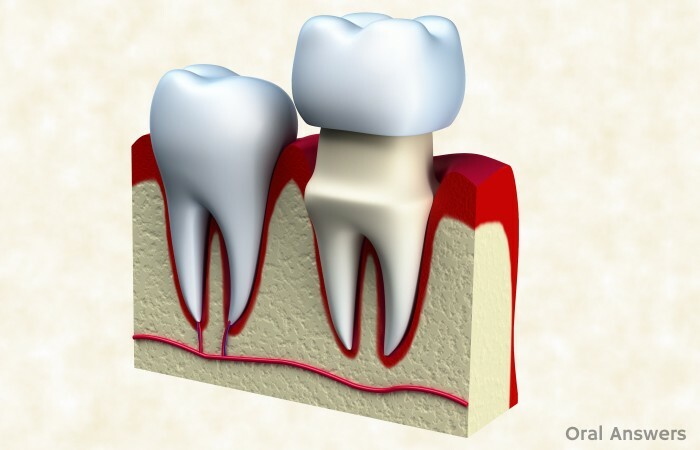 When you cemented the tooth back on, you cemented bacteria between your tooth and the crown. Your dentist will be able to properly disinfect the area before permanently re-cementing your crown. If your temporary crown comes off, you can re-cement it according to the above procedure. Your dentist will probably still have you come in for your originally scheduled appointment to have your permanent crown cemented. Let me know if you have any questions. Thanks for reading!